It’s true: the closest Venetian city to Jesolo is…Venice! Yes: if you are lucky enough to be staying in Jesolo for you holidays, you will know that one of the most beautiful and atmospheric cities in the world is located just 20 minutes away from you. This is a city that receives visitors from all over the world every day, who arrive after incredibly long journeys, maybe from the other side of the world, with the dream of seeing it. From Hotel Danubio, you can easily set out on a very short journey that will take you directly into the heart of this astounding city. Venice is known and loved all over the world for its combination of particular features, which render it a completely unique city: its long history, made up of glorious epochs; its close link with the sea, with which it appears to merge thanks to a unique morphology that makes it seem like a city floating on the Lagoon; its enormous architectural and artistic heritage, whose value cannot be exaggerated and which includes breath-taking buildings, paintings and sculptures of inestimable worth. And there’s more: Venice is also brimming over with culture, gastronomy and wine, festivals and events, while its alleys are full of friendly and lively characters. Stroll through the streets of the centre, following a touristic itinerary, or let youself be guided by instinct to discover the most beautiful and hidden corners of Venice. 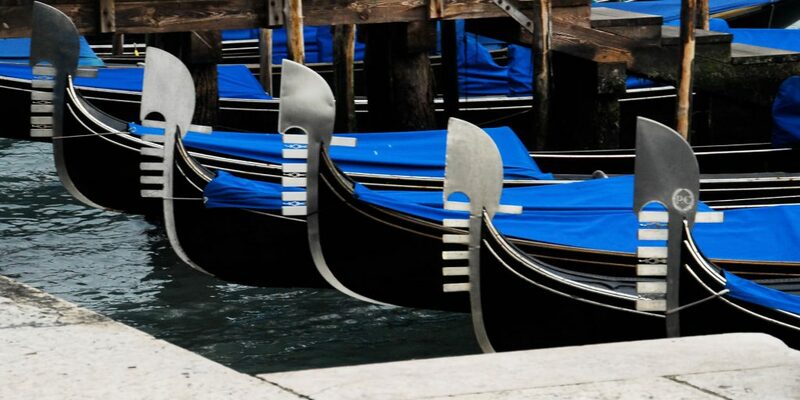 To finish off your wonderful day in this city in a fitting way, we recommend that you take a trip on a gondola, taking a tour through Venice along the waters of its canals…a memory that you will cherish forever. If you love architecture and history, you shouldn’t miss out on a trip to Vicenza. To reach Vicenza from Jesolo, it takes just two hours by car – but if you want to travel more conveniently you can also get there by train or coach. In Vicenza you can admire the works of one of the most important architects of the century: Andrea Palladio. The renowned architectural genius has left behind many great works as his legacy, and the majority of these are concentrated within the region of Vicenza: we can cite, for example, Villa Rotonda, located within the heart of the city of Vicenza, or the Basilica Palladiana which sits in Piazza dei Signori, or, finally, the Arco delle Scalette, located near the Monte Berico Sanctuary. From Vicenza you can also take a trip to the stunning Monte Berico, climbing the 192 steps that cross the side of the mountain, without forgetting to take a pause at the beautiful Olimpico Theatre. The Theatre is a historic building of rare beauty and significance, designed by Andrea Palladio in 1580 – the only building that displays within it the structural lines in the original perspective of the Renaissance, which we can still observe today in an excellent condition. A visit to Vicenza will be an unexpected pleasure and will offer you an extra dose of culture! What makes Trieste so special and so highly valued by so many tourists every year? Certainly its geographical location, on the border between Italy and Slovenia , which characterizes it as a meeting point between Western and Central-Southern Europe ; undoubtedly its very spacious central square, completely open and overlooking the sea, often very windy and sometimes crossed by the famous bora; not to mention the superb and imposing Miramare Castle, a nineteenth-century castle of rare beauty and elegance, which seems as if it is diving into the sea, which mirrors its white walls daily on the blue waters of the Gulf. However Trieste is so much more. The city with the most important port in Italy , Trieste historically has always been a meeting point between different civilizations, a point of passage for various cultures and ethnic groups: this is the characteristic that gives it that magic and uniqueness responsible for the truly unique charm which it emanates. Trieste is a city that captivates us with its multitude of dialects and languages, which can be heard simply by sitting in the square. Beyond its conformation and valuable buildings, Trieste will leave a mark on your heart. Traveling to Verona from Jesolo takes less than two hours by car: this is a destination that is made for daytrips, departing from Hotel Danubio nice and early. We recommend a visit because – if you have never been there – Verona is a city that is truly worth seeing. There are many reasons: we can begin by mentioning the buildings that are part of the city’s glorious Roman legacy, and which have rendered the city famous all over the world – first and foremost,the spectacular Arena of Verona. After all, Verona is the city of the Area, which draws millions of visitors from all over the world every year: they have always been curious and now they cannot wait to see this colossal architectural marvel for themselves, as part of the city’s ancient legacy. Many spectators also come to attend the many musical and theatrical shows that take place beneath the stars, regularly organised within the monument. After all, Verona is much more than just an Arena: a stop at Juliet’s House – another favourite destination for the many tourists who visit – can’t be missed. Or, you can visit Ponte Scaligero or the Roman Theatre, or simply enjoy a pause in the large Piazza Bra, which is always lively and, with its open spaces and many typical local bars, offers something of interest to everyone. Here, you can pause on a bench just to admire the wonderful panorama that surrounds the piazza, or explore a few typical local bars to enjoy an aperitif made from the excellent wines of the surrounding areas, or taste a few appetisers of the local cuisine. And we haven’t even mentioned the many exclusive shops that populate the streets of the centre yet, making it another popular destination among both locals and visitors from all over the world: whatever is on the itinerary, Verona will amaze you. Padua jealously preserves one of the most important artworks in the world, which has always attracted tourists from everywhere: the Scrovegni Chapel frescoed by Giotto. La Cappella degli Scrovegni has an extraordinary collection of frescoes painted by the famous artist and has now become a major tourist attraction. Padua is also appreciated for its many trendy clubs and shops , as well as for the famous university area, with what is the second oldest place of learning in all Italy. Walking through the narrow streets in this area you may well bump into some young student dressed as a ‘goliarda’, one of the oldest traditions that endures today, intent on expressing their singing skills or fooling around. Don’t expect to be able to see the whole city in one day: Padua has a lot to offer and the more you see of it, the more you’d like to discover … so don’t rule out a return visit. Falling in love with Treviso and enjoying its atmosphere is really easy: just walk through the centre, among the many dotted lanes right by the ancient Venetian palaces; pause on an ancient bridge that overlooks one of the city’s many canals; savour a good Radicchio di Treviso risotto in one of its welcoming inns or taverns, perhaps accompanied by an excellent local red wine. Treviso captivates with its vast surroundings composed of endless farmland, which often offer an excellent setting for long walks or outdoor cycle routes; for the many Venetian villas scattered throughout its province; for its green city parks, for example the Parco degli Alberi Parlanti or the Parco dello Storga. Last but not least, in Treviso you can find historical and architectural buildings of great prestige and tourist interest: the Casa dei Carraresi and the Church of Santa Lucia are just a couple of examples. It’s a short journey by car from Hotel Danubio to the centre of Treviso: if one day during your holiday you want to treat yourself to something different from the Jesolo beach, maybe because it’s cloudy… we recommend a quick hike in Treviso!